Iwate Circle of Friends is a group of Filipino and foreigners based in Iwate Prefecture in Japan. 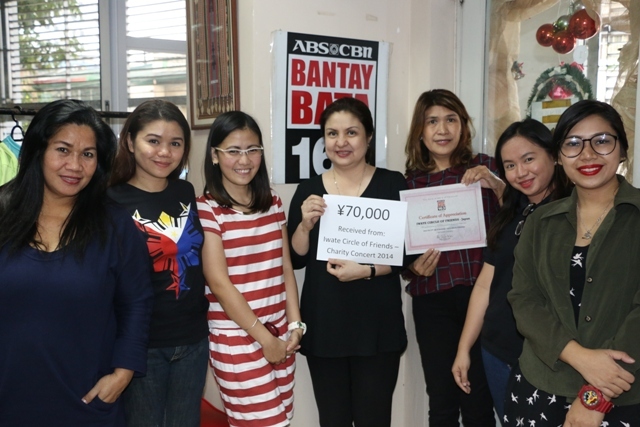 Recently, their founder Cynthia Kudo together with her daughter, Iris Fernandez, personally went to Bantay Bata 163's office to hand their Christmas gifts to children. The Iwate Circle of Friends was able to raise 70,000 Yen by holding a Charity Concert. This has been the second time of the group to support Bantay Bata 163. Aside from that, the members were also able to raise funds to help Sagip Kapamilya before. Thank you very much, Iwate Circle of Friends! Your support continues to give a new ray of hope to children in need.